VICTORIA -- Enhanced transit routes, expanded driver-training programs and more roadside webcams make up the core of a multimillion-dollar plan aimed at improving safety along a stretch of British Columbia highway renowned for missing and murdered women. B.C. 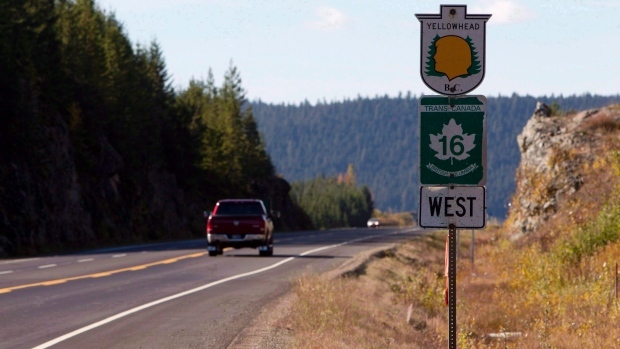 's Transport Minister Todd Stone announced a long-awaited $3-million strategy for the so-called Highway of Tears on Monday, saying delays in government action were the result of extensive consultation with local stakeholders. "I would have liked to have been making this announcement many, many, many months ago, but we needed to go through this rigorous process of engagement and discussion," said Stone. "Today is about transitioning from the discussion to action." Eighteen women, many of them aboriginal, have disappeared or been murdered along Highway 16 or adjacent routes since the 1970s. The infamous 750-kilometre span of road meanders through an isolated region of B.C. 's Interior, between Prince Rupert and Prince George. Stone's announcement comes shortly after the federal government went public with plans to launch a national inquiry into missing and murdered indigenous women. Many who have called for the inquiry have highlighted the tragic history of the Highway of Tears. An RCMP report stated last year nearly 1,200 aboriginal women were murdered or went missing across Canada between 1980 and 2012. Monday's announcement in B.C. committed $1.6 million over two years on a cost-sharing basis with communities to extend pre-existing transit along Highway 16. An additional $750,000 over three years will go towards helping communities buy and operate transit vehicles, as well as $150,000 over three years to increase the number of licensed drivers in First Nations communities. The province earmarked a final $500,000 in infrastructure funding over two years to install more transit shelters and highway webcams. "In addition to enhancing the actual transportation options that people have in the corridor, we want people to also know that we have an eye on safety as well," said Stone. Overseeing the program's implementation is an advisory panel, made up of representatives from the province, local governments, health authorities and First Nations. Burns Lake Mayor Luke Strimbold, who is part of the advisory group, said the $3-million funding announcement marks historic progress in improving safety along Highway 16. "Our communities now have a framework we can work towards to implement transportation solutions," said Strimbold. First Nations Health Authority spokesman Richard Jock is also on the board and shared Strimbold's optimism. He emphasized the opportunity to improve access to health care for people living in remote communities. "We're looking forward to working in particular with our northern health partners to see how this can really be part of effective transportation response in the North," he said. Smithers Mayor Taylor Bachrach spoke positively about the government's plan, but at the same time raised concerns. "The key question is whether the amount of resources that are being put on the table are going to be adequate to fix the problem," he said. "I'm not sure that $1.6 million over two years is going to provide affordable, accessible transportation for all of the small communities in our region. The problem is somewhat larger." New Democrat member of the legislature and northern health critic Jennifer Rice questioned if the plan's cost-sharing approach would be financially feasible for all northern communities. "Families of murdered and missing women have been waiting for some action for well over a decade," she said. "But having some money put towards improving transportation in the North is positive." Stone said the government will have a better idea about how the funding will be distributed after the advisory panel meets with local groups and reports back to him by early March.